The sitar is South Asia’s prime plucked string instrument of the North Indian classical tradition and the first one to be widely heard and recognised in the West, through the appearance of Ravi Shankar in the 1960s. 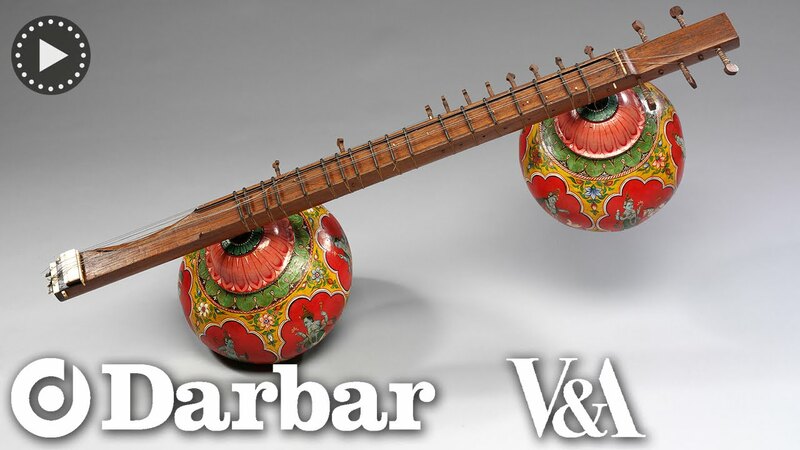 Over the last fifty years or so, the sitar, although a relatively modern instrument, has emerged as the single iconic object that defines the world’s most ancient classical music tradition. According to one theory, the sitar was invented by the 13th Century Sufi poet-mystic-musician Amir Khusrau, (variously spelt “Khusro”, “Khusrow”, “Khusraw”, etc.) who served as courtier, royal poet and court musician under no less than seven rulers after North India came under the Muslim rule of the Turkish Sultans. It is alleged that because this was a period of great political unrest and much in-fighting for succession to the throne, Khusrau felt the need to modify the ancient veena, (the dominant string instrument at this time) for a more compact and easily portable alternative. But this assertion is widely disputed on the grounds that there is another musician, of the same name, who lived some three centuries after Amir Khusrau and is also associated with the sitar and its early development. Although its exact origins are not agreed, it is thought that the word comes from the Persian “seh” meaning three and “taar” meaning string. Also, some of the specialised musical terms for different sitar techniques and styles tend to be words from the Persian language, pointing to a possible Persianised adaptation of an earlier (and simpler) Indian or Persian lute. But, the sitar could just as easily have evolved from any number of early Indian instruments including the tanpura (or tamboura, a long-necked lute) which is still very much in use to provide a continuous drone for instrumental or vocal music. Documented references to the sitar begin to appear from around the 18th Century onwards and by the turn of the 19th Century several musicians across North India had taken up the sitar with great success, attracting royal patronage from several rulers for the instrument that was not only beginning to enjoy an exalted status but also appeared to have eclipsed the ancient veena. The sitar’s unique tone and timbre is the result of its design and construction. It is made from a seasoned gourd which acts as a resonating chamber and the other material is either teakwood, (a kind of ebony) or, very rarely, camel bone but synthetic materials are now also widespread. Some sitars have a secondary resonating chamber – an additional gourd at the end of the neck – and sitars can be of varying sizes, the smaller ones often played by women. Twenty frets, made of brass and secured to the long, hollow neck with string, can easily be shifted to suit the demands of a particular raga. Also, the frets are curved, hence allowing very fine tuning and also allowing sympathetic strings to sit underneath the raised curves. The sympathetic strings also have to be tuned and they vibrate to the sound of the main strings. 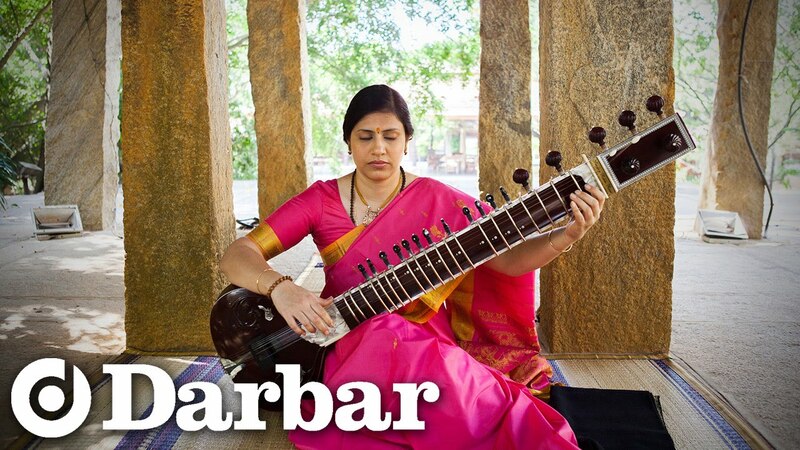 A sitar can have between 21, 22 or 23 strings of which 6 or 7 are played using a plectrum known as mizrab. Of these, three or four are simply used to produce a drone-effect whilst the rest are used for producing melody. There are two bridges, a large one for playing the drone strings and a smaller one for sympathetic strings. This is a rare hybrid instrument, unique to the Pune region. It looks like a rudra vina or bin and has the same sequence of strings, but it is smaller, and the moveable frets and flat-faced neck are like the sitar, which was more common by this time. The resonance comes from the hollow neck as well as from the gourds. The paintings mostly show manifestations of the god Vishnu. In recent years, there have been many more modifications in the structure of the sitar, the exact construction and design being determined by who happens to have ordered it. Also, in an age of microphones and sound amplification, more musicians have felt the need to deliver a “larger” sound, by attaching an additional hollow gourd at the other end of the neck. Several others have experimented with its tonal quality by adding or removing strings, or by increasing or decreasing the number of tuning pegs. There is also a bass-sitar known as surbahar, which has a wider and longer neck than a regular sitar but its frets are fixed. The end of the 19th and the beginning of the 20th Century was a crucial period for Indian classical instruments with two main opposing schools of thought on how an instrument should sound: there were those who attempted to emulate the more recent, highly ornamented and romantic khayal style of playing (based on the vocal genre which had emerged as a favourite), as opposed to those who sought to restore the original dhrupad-veena flavour of the days of the in a style known as “senia”, after the legendary 16th Century Mughal court musician Tansen. The senia style was the preferred format for one of the 20th Century’s most influential maestros, Allauddin Khan, who lived to be a hundred years old and is said to have mastered thirty different instruments, including some Western ones. He also gave to the world two of its greatest musicians of all time, the sitar player Ravi Shankar as well as his own son, Ali Akbar Khan, (who played sarod.) This senia style was eventually perfected in the gharana, (school or style) known as Maihar with Allauddin Khan as its leading exponent. It is widely thought that the gharana was created after Khan had already made his mark and also that it was specifically created to honour the instrumental style that he had immortalised. The most famous 20th Century representative of this style was Ravi Shankar, (1920 – 2012) who not only continued in the Maihar tradition but, quite literally, took the sitar all over the world making it synonymous with Indian music. Nikhil Banerjee, (1931 – 1986), also a pupil of Allauddin Khan, did not achieve the high-profile international fame of Shankar, but he toured widely and is considered among the great legendary players of sitar despite a relatively early death. Ravi Shankar also trained numerous students including Bhaskar Chandavarkar, Kushal Das, Kartik Seshadri and Shubhendra Rao. The somewhat revolutionary khayal style of playing instruments was taken up by another great gharana, (or family of music,) headed by Imdad Khan, (1848 – 1920), and also named “Imdadkhani gharana” after him. He was the grandfather of the famous 20th Century sitar maestro, Vilayat Khan, (d.2004). Vilayat Khan’s father, Enayat Khan, (1894 – 1938), who played both sitar as well as surbahar, (bass sitar with a tone very close to the ancient veena,) continued in his father’s style, adding many hallmarks of his own despite the fact that he died relatively young, aged just 43. He is reported to have been the first sitar player to fix an additional gourd at the top end of the instrument. Vilayat Khan himself further perfected his father’s playing technique to the extent that it became widely known as “gayaki-ang” literally, “a singing style” of sitar. Highly embellished and producing an entirely different timbre from the better-known sitar of Ravi Shankar, there are many who would testify to the fact that when Vilayat Khan played, indeed, the sitar appeared to be singing all by itself. This style continues with his descendants as well as other members of the family. In the 20th Century, it was the Imdadkhani gharana that provided the largest number of distinguished sitar players, including most of Imdad Khan’s great-great grandsons as well as other descendants like Shahid Parvez and Rais Khan. There have also been some outstanding pupils who are not related to the family, namely, Pandit Budhaditya Mukherjee and Pandit Arvind Parikh.